I have been working very hard to complete the testing, cooking and photography for a new book, The Cook’s Table, to appear in November, 2016. 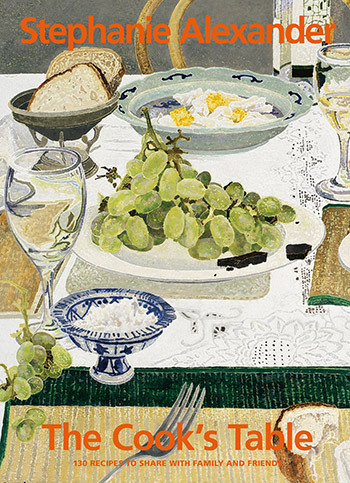 The cover is taken from a woodblock by the talented Cressida Campbell. The Cook’s Table features 25 chapters, each presenting a menu inspired by an occasion or place from my memory, such as ‘A Jamaican Jerk Party’, ‘Birthday Party for a Teenager’ and ‘Autumnal Italian Lunch in a Suburban Farm’. Arranged in menus, the recipe collections evoke a shared table with family and friends, and beckon the reader to create special occasions. Each menu includes recipes, cooking timetables and shopping lists. This book has sprung from my desire to revisit memorable meals often enjoyed in equally memorable locations. Sharing food experiences has always made me happier than anything else. Anticipation is part of this, and that includes planning the menu. The Cook’s Table can be pre-ordered from Booktopia and Angus & Robertson.